As releases, he has under his name Just Music and Saint Omar, at Be Chosen and Untitled 1 / Untitled 2 and Ramble on / Four Sticks, at Kurbits Records. Other appearances feature In the mix - Green and Blue, at Cocoon Recordings, 3rd exposure at Exposed Audio, 200709 at Loopzilla and Taram EP, released by [a:rpia:r]. You better write his name on your 'must listen to' list, because he is worthy to be heard! We're thrilled to have him soon the first time under the tree. YES, YES our good friend Ross is back at our favourite grocery store! After his last time under the tree and one of his best set we’ve ever witness from him he is back in town! DJ. Raver. Record Collector. Music Head. Healer. He is one of the few DJ’s that’s made his name through the immense quality of his DJing alone. Armed with a relentless library, blurring cutting edge House, Techno & forgotten gems of the past! A true raver himself, its evident Rossko's consistency and understanding of the dance floor will continue to move people with his ever-evolving sound. 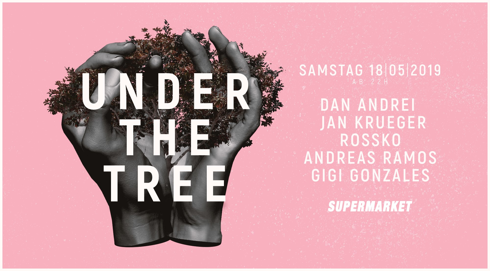 The fourth one who’s joining this unique get-together is Zürich’s most famous record store owner, Andreas Ramos! Shaking up Zürich’s nightlife since years, his floaty and exceptional music taste represents the city groove perfectly. It’s always a pleasure to have him!